Robert E. Howard created the character Conan in the 1930's. Living in the Texas countryside, he wrote an impressive number of short stories published by the popular magazines called "pulps". He wrote hundreds of stories and he was one of the rare authors of that time able to live on his work, thanks to his fantasy stories but also horror and historic adventure yarns. This prolific writer with unquestionable talent shot himself at the heights of his fame at the age of thirty in 1936. Only about twenty Conan stories came out of his imagination, including one novel; but that was enough to create the legend. Issues of "Weird Tales" magazine in which they were published, and of which Conan was often on cover, found a big success. At the end of the fifties, an unknown writer named Lyon Sprague de Camp, whom motivations were not only artistic, proposed a publisher to reprint Conan stories peppered with his own works to "revise and complete" (helped by a few other writers) the Conan Saga. If this manoeuver probably helped the character Conan to access a larger public, it also mostly contributed to make it dull, comparing him to some Hercules bending iron bars! If Sprague de Camp even managed to be credited in Milius’ movie titles as a technical advisor, he is far from having shared Howard's genius. In 1970, the first comics inspired from Howard's work came out, also including original stories; here also we can find good things but also very bad ones. CONAN THE BARBARIAN came on screens in 1982. If the movie widely contributed to Conan popularity outside the USA, it must be known that the number of reprints was already huge long before the movie premiere. In France, lots of Howard's stories were already published, as many from other famous pulp writers, like H.P. Lovecraft. If Milius doesn't borrow a full story line from any Howard story in particular, he digs cheerfully into the pile of situations and actions described by the Texan. Besides, Milius' script was based upon a first draft written by Oliver Stone, which had already included some Howard material. The movie is above all a free interpretation of the Hyborian world created by Howard, even if Milius drew many ideas directly on him. The first borrowing, already in Stone's script, is the entry monologue, taken from "The Nemedian Chronicles", an ancient "historic" text supposed to relate Conan's history and opening his very first published adventure: "The Phoenix on the Sword" (1932). Although we don't meet his parents in the written stories, Conan says he is the "son of a blacksmith"; but Conan’s mother is never mentioned by Howard. It is also certain that the Cimmerian left his native soil to explore the southern countries. His god is Crom, who lives on a mountain and never answers to prayers. The break-in of the Tower of Set is taken from "The Tower of the Elephant" (1933), in which Conan, still a young and inexperienced thief, decides to visit a tower said to be impregnable and concealing an unvaluable jewel: the Heart of the Elephant. In the gardens, he meets Taurus, a famous Nemedian thief known as the "Prince of Thieves". They both agree to become partners to enter the tower which shows no door, except on its top. In the movie, Conan and Subotai meet Valeria in very similar circumstances (she was identified as the "Queen of Thieves" in some deleted dialogues, as can be still read in Sprague De Camp's novelization of the script). But, in the movie, they all come out alive of the tower, whereas Taurus dies under the attack of a creature guarding the top of the tower (this scene was used in the Stone version). The same Howard story maybe also partly inspired the character of Thulsa Doom. The owner of the tower is an evil sorcerer several centuries old, and feared by the king (as is Doom's lieutenant, Rexor, in the movie). The jewel hidden in the tower has magic properties, like presumably in the firsts versions of the script (again, in the novelization, Conan uses it to unveil the true nature of Doom - a serpent man! - to his believers). Valeria claims, causing King Osric great mirth, that the third man of their party has been eaten by lions. She is referring to the gardens of the Tower of the Elephant, guarded by a pack of lions in Howard's story. We also learn that the Zamorian civilisation in which the events occur, is "ancient" and "evil", almost Subotai's words to Conan when they arrive to the first city in the movie. At last, still in the same story appears the Black Lotus. Taurus casts a cloud of deadly powder made with this plant to take rid of the beasts. In the movie, the Black Lotus becomes exhilarating leaves chewed by Conan and Subotai. In "The Hall of the Dead" (1967), written by Sprague de Camp based on a synopsis found in Howard's papers, and placed directly after "The Tower of the Elephant" in standard Conan chronology, our hero is hunted down by soldiers of the King of Zamora. At the end of the story, he goes back to his favourite inn to show his booty to his girlfriend of the moment. This reminds a very similar scene of the movie in which Conan and Valeria admire the jewels stolen in the Tower of the Serpent displayed on a table. But it is the female character of Belit (a pirate again!) who will, in "The Queen of the Black Coast" (1934), become Conan's great love. She will come back from beyond the grave to save him during a desperate fight, as will Valeria in Milius' script. In the same story, Conan sets fire to the remains of his beloved one with her ship; in the movie, it is a funeral pyre on a tumulus for Valeria. In Howard's writings, the cult of Set is confined to Stygia, a country dominated by a cast of evil sorcerers, inspired from ancient Egypt. The symbol of the snake has been kept but the cult has been transformed in an expansionist sect in the northern kingdoms, as early as Stone's draft. Conan always had very bad relationship with snakes, even in Howard's stories. In "The Scarlet Citadel" (1933), a giant snake comes close to Conan who is chained to a wall in an ancient underground complex. A drop of acid venom falls on the warrior's thigh, who overcomes his pain and manages not move and betray his position. The creatures comes back later to devour the human enemy who was coming to slay Conan. In "The Devil in Iron" (1934), the quarrel is settled in a close combat, in a scene very similar to the one shot by Milius fifty years later. 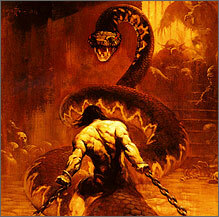 But it is in "The Hour of the Dragon" (1936) that Conan slays a giant snake associated to Set's cult. The beast roves in the streets of a stygian city that Conan, deposed king at that time, visits incognito. The animal is sacred for the inhabitants who kneel in front of it and even let themselves been eaten if it's hungry. Conan kills the beast with a blow of his knife and runs away under the insults and screams thrown out in the night by the worshippers. In that same story, Conan puts on the dress of a priest he kills to enter a temple. In the movie, Valeria uses the same trick to visit the Tower of the Serpent, and Conan to enter the Mountain of Power site. Thulsa Doom's name, already in Stone's script, is taken from another cycle of stories developed by Howard before Conan: King Kull of Atlantis. He appears in two stories: "Delcardes' Cat" (1967) and "Riders beyond the sunrise" (1967). Thulsa Doom is a very powerful necromancer, whose face is composed of a fleshless skull (note that the same concept was taken to create the Skeletor design for the very Conan-inspired "Masters of the Universe"). The origin of Thulsa Doom's metamorphosis in the movie is often attributed to another Kull story, "The Shadow Kingdom" (1929), but it is questionable. In that story, Kull's kingdom is infiltrated by serpent-men with human appearance. But they are not men turning into snakes, only humanoid creatures with snakes heads revealing when the kings kills them. This stops the magical camouflage; the face is blurred for a moment before to unveil its real nature. But, in "People of the Black Circle" (1934), Conan fights a sorcerer who can turn himself into a giant snake. Thulsa Doom's unsuccessful attempt at hypnotizing Conan is inspired by a scene from the same story (but this far too civilized technique can't work on a barbarian mind as the Cimmerian's), as well as the transformation of an arrow into a snake and vice versa. The Witch episode shows similarities with a story from the Bran Mak Morn cycle called "Worms Of The Earth" (1932), happening during the Roman occupation of Scotland. The Pictish hero reluctantly accepts to spend the night with an horrible half-human sorceress, in order to make contact with the fiends which will help him to revenge. The character already appears in Stone's script, but does not ask for payment in exchange of information. The Atlantean sword scene is taken from "The Thing in the Crypt" (1967), written by Lyon Sprague de Camp as an introduction to Conan adventures. Conan, hunted down by wolves, takes refuge in a forgotten crypt, where he finds the remains of a warrior from which he takes the sword. The story establishes the Atlantean origin of the weapon and even suggests it could have been handled by Kull himself. But the mummy is not generous and awakes from its millennial sleep to oppose the thief. Stone and Milius borrowed other elements from that story: we learn that Conan knew slavery after his band has been ambushed by Hyperboreans, another Nordic people. It is after a night of violent thunder that Conan has escaped and flees to the south with wolves on his tail. The other significant aspects (the Riddle of Steel, Conan's slavery during his teenage years, his gladiator career in the east, the Hyrkanian character of Subotai ) comes from Milius's imagination. Howard's Conan was still living in his tribe at the age of fifteen, when he took part to a raid on the Aquilonian outpost of Venarium (these events are mentioned in the saga but not directly recounted). The character played by Schwarzenegger doesn't have this "black mane hair" nor is he walking "with the supple ease of a great tiger" as Conan does in Howard's writings. In spite of these differences, Milius' movie is very faithful to the spirit of the Hyborian world imagined by Howard. Oliver Stone' script, even if it was using "A Witch Shall Be Born" story line (and, in a lesser way, the "Black Colossus" one - 1933) was incorporating many supernatural features like mutants, evoking more some comic books than Howard's work, which always remain coherent even if you delete any "magical" element. The liberty taken by Milius, even if it upsets many fans, serves a rich and very beautiful story, that Howard probably would not disown, and the present article shows how much it takes from his yarns. We can however deplore that the movie character lacks a few of the many qualities of the original: a brutal complexity, a distrust toward the people pretending to be civilized, maybe difficult to translate to the screen. If the saga had continued with scripts and direction of the same quality, maybe we could have seen that. A few words on CONAN THE DESTROYER, directed by Richard Fleischer two years later. The plot uses several Howard’s elements too: the sorcerer Thoth-Amon , which can be seen in "Phoenix on the Sword" and is mentioned in a few other stories; the ape-like creature with a red cape, taken from "Rogues in the House" (1934) ; the tattoo designing the princess as marked by destiny, inspired from "A Witch Shall Be Born"; the Book of Skelos (renamed the "Scrolls of Skelos" in the movie), a powerful book mentioned in many Howard's stories: The Devil in Iron, The Pool of the Black One (1933), The Hour of the Dragon; god Dagoth, in fact the name of a mountain in "The Scarlet Citadel"; and, at last, the Heart of Ahriman, taken from "The Hour of the Dragon". The movie synopsis, more linear, evokes, from very far, this last story, focused on the quest for a supernatural jewel. But its treatment recalls the worst comics stories of the barbarian. Maybe because one of the script writers was Roy Thomas, who wrote/adapted most of the Marvel Conan comics? Nevertheless, it is difficult to accept the idea of Conan agreeing Queen Taramis' (a name taken from "A Witch Shall Be Born") proposal to resurrect Valeria. Conan hates every form of magic and would probably consider her ghost as a demon! And it is absolutely unthinkable that Conan associates with someone as insignificant as Malak! To conclude, let's examine the KING CONAN: CROWN OF IRON script, written by Milius as a sequel (and ending) to Conan adventures. If, in the first versions, a scene was taken from "The Frost Giant's Daughter" (1953), it completely disappears in the last drafts, in which nothing really comes from Howard. It is known that Milius' dream was to make a Viking movie and that the first CONAN helped him to partly fulfill that dream. With that new script, it is visible he wants to make a Roman movie, with Aquilonia as the centre of the empire, Zingara as a province, Pict lands as a future one... He transforms the context to create a beautiful story indeed, but having nothing to do with Conan's world. His script has less common points with Howard than CONAN THE BARBARIAN had. Imagining Conan bending to a third person's will to abandon his son is a complete nonsense! Making him wanting Aquilonian citizenship, even worse. This character is not Conan, but a Celt whose province is Romanised for one or two decades. It seems that Milius tried to use is "CONAN fame" to create a personal project having nothing to do with Conan. In my opinion, we could simply replace names of Conan and Fortunas by Maximus and Commodus to have a better understanding of the script. - Must see: the beautiful movie THE WHOLE WIDE WORLD (1996), by Dan Ireland, about Howard's last years with Vincent D'Onofrio and Renee Zellweger. - Must read: "The Coming of Conan the Cimmerian", "The Bloody Crown of Conan", "The Conquering Sword of Conan" (Del Rey), original Howard's texts expurgated from all Sprague de Camp modifications.